Organization to help your at-home business bloom and grow! Managing all of the tasks, projects, events, meetings, and appointments in your life is no small feat. But it can be done with the help of an inexpensive and easy to set up tool. Today’s post will show you 4 simple ways to organize your life with a tickler file! There are a lot of things to organize, manage, and remember as a work-at-home mom (or dad). Tasks, projects, events, and appointments, oh my! But there’s an affordable, easy to create, straightforward tool that can help. And it transitions seamlessly between work and business. Read on to learn the 4 simple ways to organize your life with a tickler file. What’s a Tickler File and How Does It Work? Before we jump into today’s organization strategies, let’s talk about what a tickler file is and how it works. A Tickler File is a series of hanging folders used cyclically to sort, organize, store, and manage future tasks and activities. Anything that you need to be reminded of at a future date can go into your Tickler File. A Tickler File requires 43 hanging folders and a drawer or box to hold them. Twelve of the folders are labeled with the months of the year and the remaining files are labeled 1-31. * You can also create a Tickler File with several sets of 4 weekly folders instead of the 31 daily folders. Your Tickler File can help you manage your workflow by acting as an internal mail system. It will hold all of the items related to your “piece of mail” in one place! I especially love this tool, because of the seamless integration of tasks related to family, home, and business. You can learn more about how to create a tickler file in this post, Get Organized with a Tickler File. Now that you know what a Tickler File is and how it works, let’s talk about a few simple ways to organize your life with a Tickler File! You know all those projects that you need or want to do but that don’t have deadlines? Things like updating your password log, computer data entry, or finally launching that new product? They’re still cluttering up your desk and office and NOT done, right? Sometimes we need self-imposed deadlines and gentle reminders to tackle those tasks or projects. And that’s where your Tickler File comes in! Let’s take the password log as an example. So, I tell them to write it on a sticky note and put it in my inbox. Hence the stack of random bits of paper scribbled with passwords. So, I have this collection of passwords, and it’s time to update my password log. But I can’t do it right now, so I put them in the next empty folder in my Tickler File, which happens to be the folder for the second week in July. When the second week of July rolls around, I’ll pull the corresponding folder out of my Tickler File and complete the tasks and projects filed in it. And, voila, my password log gets updated, and I can shred all of those random bits of paper! That project won’t sit incomplete any longer, because I built in a system for giving it a deadline and reminding myself to complete it. I also have time to work on this project already blocked out in my schedule (my weekly Tickler File block)! Assigning deadlines and reminders to complete internal projects and tasks is the first way to organize your life with a tickler file! Action files (also called current files) hold any papers that require your attention or that require you to do something. That could include a proposal request that needs fulfilled, a report that needs written, or papers associated with an in-progress project. You need action files at your fingertips, so that you can take the required action in a timely manner. I house my action files in my Tickler which works beautifully, because I already have an established Tickler File routine. So, the items in my action files get processed in a timely fashion. Plus, my Tickler File sits right next to my desk, putting my action files at my fingertips, but I don’t take up valuable desk space to store my Action Files. When my action file time block rolls around, I just grab the first file out of my Tickler and tackle the tasks in it! To learn more about action files and how to create your own set, check out this post: How to Use Action Files to Manage To-Do’s! Managing and storing ongoing projects and all of the resources associated with them is another simple way to organize your life with a Tickler File! I keep a few empty hanging folders in the front of my Tickler File. When I start working on a project that will be ongoing, I convert one those empty folders to a storehouse for all of the papers, research, and notes for the project. If I’m working on the project on a daily basis, I leave the file at the front of my Tickler File right behind my action files. If I’m working on it more intermittently, I place it behind a weekly file. That placement reminds me to spend some time on it that week. When it’s time to work on this project, I grab the hanging file, which includes everything I need. When it’s time to finish up, I just return everything to the hanging folder and put it back in my tickler box. No paper piles or desk clutter! Organizing and storing ongoing projects is one of my favorite ways to organize your life with a tickler file! The final way to organize your life with a tickler file relates to external deadlines and giving yourself reminders to do what needs to be done before that deadline. I received an invite to a bridal shower, but I’m not sure I’ll be able to go. So, I filed the invitation in the folder corresponding to the week before my RSVP is due. I’ll have a better grasp on my schedule at that point, so I can RSVP in plenty of time! My professional association membership needs to be renewed in a couple of months. I need a little time to save for the membership dues, so I filed the renewal notice in the folder for the week before my renewal is due. That way I can save for the renewal but still complete it in plenty of time to avoid a lapse in my membership. And that’s the final technique for organizing your life with a tickler file. Not only does my Tickler File help to provide me with reminders of important internal and external deadlines, but I’ve cleared all of that paper from my desk and organized it. And this tool easily handles all of my roles and the items associated with them. You no longer need to lose sleep over managing the myriad tasks, projects, events, and appointments in your life. Create a Tickler File with some hanging folders and a file box, implement these 4 strategies,and organize your life with a tickler file! Do you currently use a Tickler File? Are there any strategies you’ve developed to make the most of this affordable, straightforward tool? 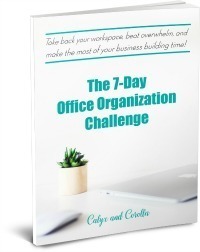 Join the Office Organization Challenge! Each day for 7 days, we'll tackle one office trouble spot, get it decluttered and organized, and create processes to KEEP it that way! 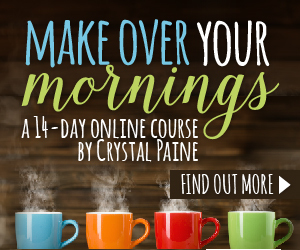 Take back your work space, beat overwhelm, and make the most of your business building time! You've successfully joined the challenge! Are you ready to take back your workspace, beat overwhelm, and make the most of your business building time? Confirm your subscription, then watch your inbox for the first challenge! Follow Calyx and Corolla on Pinterest! Sharing is caring! But please note that all text and images on this site are property of Calyx and Corolla. Feel free to use a photo, but provide a link back to my original post. Please do not alter images in any way including cropping, removing watermarks, or editing without first obtaining my written permission. Printables are offered for your personal use only. Pinning is always appreciated. Thanks!